de Camp, L. Sprague. Lest Darkness Fall . Ballantine/Del Rey 1983.
de Camp, L. Sprague. Lest Darkness Fall . 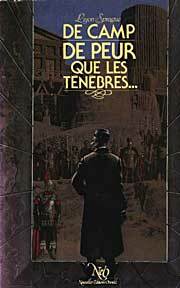 Translated to the French as De peur que les ténègbres… , NEO 1983. Summary: Mysteriously transported to Rome in the time of Justinian, a modern man decides to start up a few modern industries and avert the Dark Ages. Published: Ballantine 1949, 1974 (0345241398w88 android), 1983 (0345310160BUY); Pyramid 1963; Easton 1988; SFBC 1996. — Revision of "Lest Darkness Fall" in Unknown , December 1939. 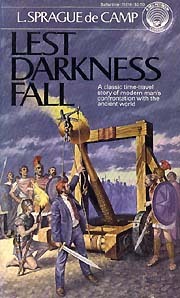 — Included in Lest Darkness Fall & To Bring the Light (w/ David Drake), Baen 1996 (0671877364BUY); and Years in the Making: The Time-Travel Stories of L. Sprague de Camp (ed. Mark L. Olson), NESFA 2005 (1886778477BUY). Translation: Nederlands by Riet Neehus-Aalderink as Een Fakkel voor het Keizerrijk , Gradivus 1978 (9063177712). Translation: French by Christian Meistermann as De peur que les ténègbres… , Marabout 1972, NEO 1983 (2730401954), Les Belles Lettres 1999 (2251771298). Translation: Italian by Gianni Atom as L'abisso del passato , Ponzoni 1959. Translation: Italian by Renato Prinzhofer as Abisso del passato , Nord 1972 (8842903019), Mondadori 1999. Translation: Polish by Radoslaw Januszewski as Jankes w Rzymie , Alfa 1991 (8370014488). Translation: Portuguese by Eurico Fonseca as A Luz e as Trevas , Livros do Brasil 1987. Translation: Spanish by Domingo Santos as El tiempo no es tan simple , J.J. Fernández Ribes 1976 (8436508475). Translation: Swedish by Christina Fagerström as Om mörkret faller , Optima 1983 (9176480062). Stirling, S.M. "The Apotheosis of Martin Padway"
Summary: Time travelers go back to c. 570 to see the Great Man who helped restore the Western Roman Empire. Series note: Sequel to L. Sprage de Camp's Lest Darkness Fall . Published: In The Enchanter Completed (ed. Harry Turtledove), Baen 2005 (0743499042w88 androidBUY); and Ice, Iron and Gold , Night Shade 2007 (1597801151BUY).